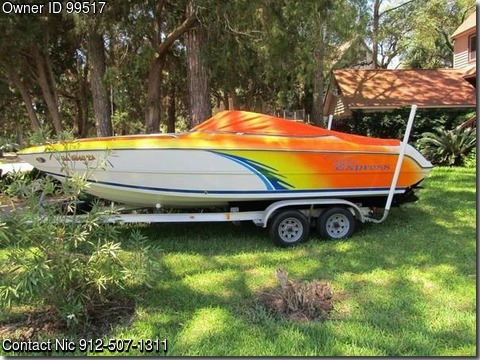 Please call owner Nic at 912-507-1311. Boat Location: Tybee Island, Georgia. GO FAST 1999 STINGRAY 220SX, tandem trailer with spare. 350 MAG EFI 300 HP WOT 60mph – only every once in awhile Engine is solid – with no problems mechanic’s name number on request. CAPTAIN’S CHOICE exhaust, year old custom paint job, bimini, full boat cockpit covers. GSP, VHF Radio, AMFMCD player, stove and sink – never used Life preservers, throw cushions, skis tow rope, fire extinguisher,power engine hatch cover hatch cover has a few tears, snap-in carpet, fenders,docking lights, blue under boat lighting effect . . . many extras.